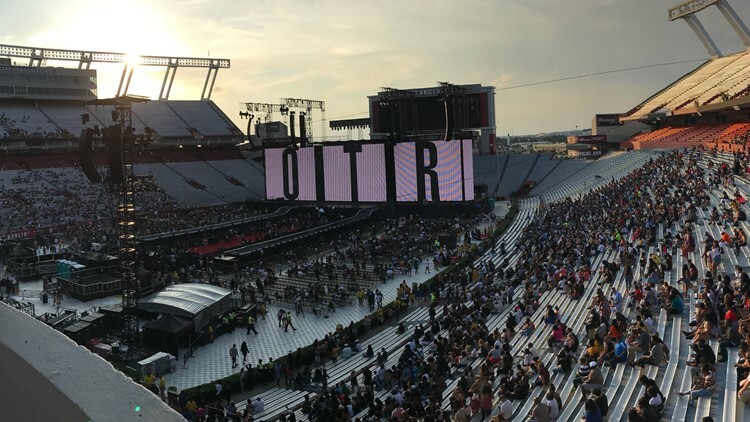 Music superstars Beyonce and Jay thrilled in Columbia, as their 'On the Run II" concert tour made a historic stop in Williams-Brice Stadium Tuesday night. 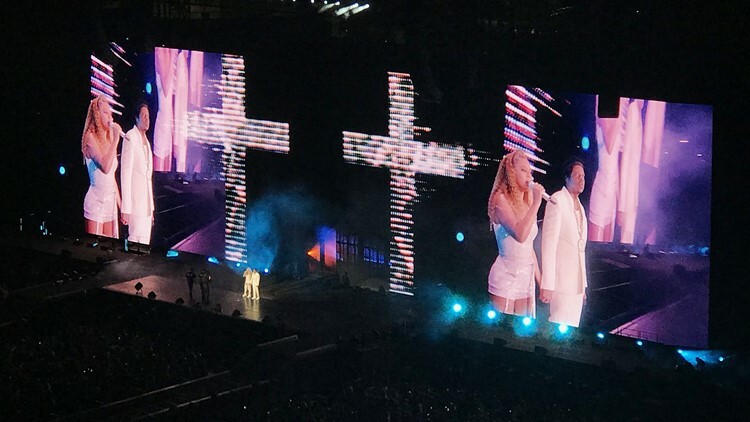 Columbia, SC (WLTX) - Music superstars Beyonce and Jay thrilled in Columbia, as their 'On the Run II" concert tour made a historic stop in Williams-Brice Stadium Tuesday night. It become the talk of the town: tens of thousands showed up. The night started with performances from Chloe X Halle and DJ Khalid. But just before 9 p.m., the headliners took the stage. And it delivered what most fans would have anticipated. Backed by a gigantic video monitor, the pair performed many of the hits that have made them among the most popular artists in the world over the last two decades. There were slow songs, fast songs, raps, dancing, and even inspirational quotes to get the crowd excited. Beyonce and Jay-Z perform at Williams-Brice Stadium in Columbia. This was just the third concert at Williams-Brice Stadium in the last 20 years, and the first since Kenny Chesney in 2008. It's also a little bit of history, since it was the first time an R&B and rap act (all the others were rock or country) to play venue. The two also received the key to the city from Columbia Mayor Steve Benjamin. We've collected just a small sampling of the social media posts that were sent, which give you a feel of what the fans inside saw. 11:15 P.M- That's a wrap! 11:10 P.M. - The dancing is LIT! 11:09 P.M. - Look at that light show for the fans! This view also shows you how packed the show eventually got. 10:40 P.M. Some fans got pretty close! Good news for fan! No rain before the end of the concert. The weather held off for the show. Looks like we may see rain, but not before midnight, says News19 Chief Meteorologist Jim Gandy. 10:15 P.M. - Check the production value! The couple knocked out one of their hits from early in their relationship, "'03 Bonnie and Clyde." The video board, at one point, showed both of them holding their newest little ones: their twins. A little taste of what the video monitors were showing the crowd during the Jay Z and Beyonce show. The headliners, Beyonce and Jay Z, have started their performance. Hip-hop star DJ Khalid was the lead opening act for Beyonce and Jay Z. The young R&B duo came out to entertain the crowd early on. Here's what it looked like inside Williams-Brice Stadium, before the crowd came in. This was at the intersection of Rosewood and George Rogers Boulevard. Lot of cars. 6:52 P.M. Could storms impact the show? News19 Chief Meteorologist Jim Gandy says the latest high resolution model is indicating a chance for thunderstorms to move through the Columbia area after 10 p.m.
We'll continue to monitor thought the night. We could come through it with nothing. Still just a little tough to tell exactly which areas might be impacted. Lots of people are on the COMET buses to shuttle over to the show. 5:30 P.M. - Main act already here? News19 morning anchor Brandon Taylor says he saw the Beyonce motorcade come by the stadium around 5:30 p.m. The show is set to begin at 7:30 p.m., but that's just the opening acts. The main performance will start at least an hour later. Speaking of parking and traffic, here's a map that shows the pre-show traffic flow. Dozens of people took the Comet--the city of Columbia's public transit system--up on their offer to take a shuttle to the concert. The shuttle takes people from either the State Museum or the Lincoln Street Parking Garage to the stadium. When we check in, there were plenty of people who hopped aboard.